It happens that a person faces the problem of tight shoes: when buying any model is perfect, and then, in the process of walking becomes uncomfortable, cramped, too tight, squeezes your fingers, rubbing the heel. In this case, you can stretch the shoes. There are several proven ways of stretching tight shoes at home. But it is worth remembering that you can successfully stretch the shoes, which is only slightly less than the desired size. There are several ways to influence the tight shoes that are suitable for products of different materials (genuine leather, faux, suede, patent leather shoes). These stretches are also the safest of all possible models, except the boots, fur lined. Special emollients for shoes. They are applied on the inner side of the Shoe precisely on the problem areas. (If your genuine leather shoes, then you can apply and outside). Immediately after the treatment the shoes need to wear with thick socks until the sections are dry, taking the form of legs. This stretch can be repeated several times to achieve the best result. Stretching using castor oil is also a universal method of influence on tight shoes. After treatment with the oil inside, need a few hours to walk in the shoes. The oil softens the problem areas, making the shoes takes on the exact shape of the foot. This method is the fact that after the procedure, the fat from inside the shoes should be thoroughly clean. Replace the oil with an alcoholic solution (with water one to one), Cologne, and even kerosene. But this method is even more uncomfortable, as the smell after the treatment will persist for a long time. Products made of natural leather are the most durable and long lasting. Therefore, they can withstand more aggressive methods of influence. For example, high and low temperatures. Under the influence of high temperature natural skin can dilate and become softer. Heat the shoes with a Hairdryer, or hold it for some time over boiling water. Heated shoes need to be worn until cool and dry. Warm skin immediately acquires the desired form and retains it for a long time. After the procedure, the skin is not dried up should be treated with a nourishing cream for shoes. Stretch genuine leather shoes you are also exposed to low temperatures, by freezing. First, shoes are inserted into plastic bags (each 2 in case of rupture of the package). Then the inner package filled with water. You need to track that inside the Shoe is not formed large folds, for this packages should be possible to straighten. The water should completely fill the space inside the Shoe. A plastic bag of water tied and the other left open. In this position, the shoes are placed in the freezer at least overnight. In the process of freezing water will gradually increase in volume, stretching the shoes. After treatment shoes one way or another is necessary to apply the cream. Usually, genuine leather shoes few weeks of wearing it can be posted independently. So, perhaps we should not rush to such radical measures stretch. These shoes stretch a lot harder than natural. When exposed to high temperatures, these products come in a state of disrepair. So we must act carefully. The most effective and safest method of stretching will be the filling with a wet paper or cloth. Cloth (paper) to moisten in hot water, quickly wring out and fill the inner space of the Shoe. Filling the shoes need to very carefully design the shape, in order to avoid distortions or deformations. Shoes with padding should be dry and away from sources of heat. It will take a lot of time. But, after drying shoes will retain the indicated shape. If unnatural shoes rubbing heels, you can RUB the inner side of the heel with paraffin or soap. For the boots without the fur lining it is possible to apply the same methods of stretching, and shoes. And boots with lining can be treated with a softener of the skin or oil on the outside only. The safest way is to wear several pairs of socks (for greater efficiency, you can dip them in hot water) and so wear a few hours. The procedure must be repeated several times, since wearing a wet winter boots with fur lining to dry completely impossible. Removing worn-out boots need to stuff them with paper or pieces of soft tissue. To dry the boots should under natural conditions, away from heat. Such products can be treated only from the inside. Any impact on the outer surface may damage the shoes. You can only use the methods of stretching with a soft gentle without temperature loads. Best suited rassasyvanie shoes in a warm, wet socks (pre-soaked in hot water) until dry. In addition, you can also use the gasket with a damp paper or cloth. Suede should be elastic enough so it can be posted, often just dressing at home. After a while she is sitting" in the form of the foot. Morning practically every person foot more sophisticated than in the afternoon. During the day, tired feet are a little swollen. So buy new shoes better in the second half of the day. Shoes purchased in the morning, the evening can be very close. When choosing a new pair of shoes you also need to pay attention to the completeness, width and instep. Perhaps the model of the right size will not work for other parameters. If shoes are too tight, do not buy a size larger. From sliding forward and back on my feet formed blisters. Not worth it after buying a new pair of shoes immediately to leave it on the street. Before that you need some time to walk around in them at home. If discomfort shoes that are not worn on the street, you can return or exchange at a more convenient model. When stretching shoes at home you need to act with extreme caution. To stretch the shoes without harming her, only half size, no more. 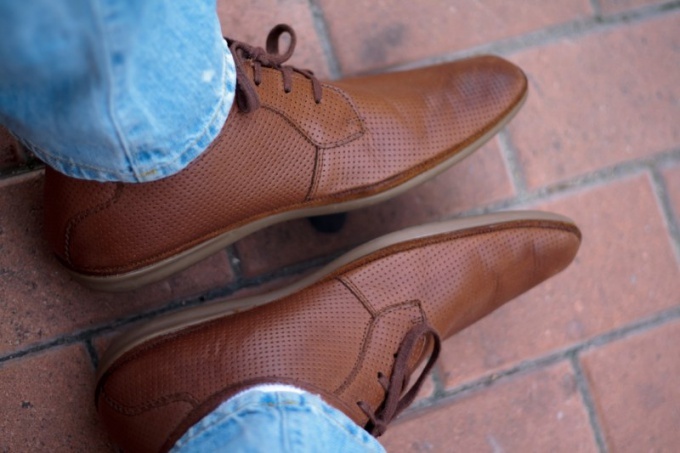 The genuine leather shoes are best "amenable to" stretching. Shoes or sandals, of textile fabrics stretch is almost impossible, strong action will only disrupt the structure of the material. On the shoes of imitation leather after freezing or just wet processing can cause cracks. Shoes of poor quality, poorly treated skin after wet processing when dry will become even more rigid and warp. Very expensive shoes is not necessary to stretch yourself. It is better to contact the Studio, where we use special Shoe lasts of different sizes.